It’s easy to teach the order of the books of the New Testament through song! The 44 full-color cards provide visuals (without words) for 12 songs. The words and sheet music are included in a separate booklet. 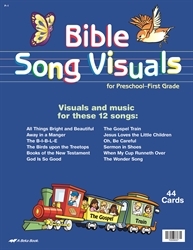 Watch your child’s enthusiasm for these doctrinally rich songs grow as he sings along to these colorful pictures. Includes the following songs correlated to the Bible curriculums for nursery, K4, K5, and grade 1.